With a driver-focused cockpit sitting at the heart of a family-focused interior, New E-PACE takes the rewarding Jaguar driving experience and adds everyday practicality. There’s never been a compact SUV like this before. 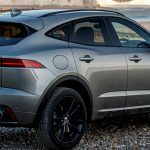 The E-Pace P250 AWD’s 246-hp turbocharged 2.0-liter inline-four in the zero-to-60-mph contest, where it did the deed in 7.2 seconds. The EPA estimates 21 mpg city and 28 mpg highway for the E-Pace P250; in our real-world 75-mph highway test, we recorded 27 mpg. After nearly 1000 miles, in conditions that included stints of more spirited driving, the E-Pace returned 18 mpg, some 25 percent worse than its EPA combined estimate of 24 mpg. As with any vehicle, your mileage will vary based on how mild or wild your driving style is.